This summer I had the opportunity to attend the D2L Fusion conference in San Diego, CA. This was an amazing experience to meet with other educators, Learning Technology Specialists, System Administrators, and others from around the nation. Education was represented from K-12 to higher education. Stories, ideas, best practices, experiences, frustrations, and emerging technologies were shared. D2L is launching a new version of their LMS in December. Like any new technology that is introduced, great anticipation is accompanied by great skepticism. In many cases D2L has listened to its users, faculty and students, to enhance many features. Whether they work the way they are supposed to remains to be seen. The challenge to faculty is to find ways to optimize this powerful learning system to enhance meaningful learning for our students the most effectively and efficiently. This is a guest blog post by Kelly Rinker, an instructor in the Health Services Administration. This August I attended the 28th Annual Conference on Distance Teaching and Learning in Madison, WI. This was my first year attending that conference and the conference started off slowly with a less than engaging opening Keynote speaker but ended with a BANG with the Keynote presentation by Judy Brown entitled “Learning in hand with mobile technology”. Judy’s presentation provided a very good closing for the numerous sessions focused on the use of mobile technology in the learning environment and reinforced the need to continue to think outside of the classroom in our ability to reach students. With the numerous technology choices available it is important to remember that technology does not replace the need for faculty engagement with students. One presentation that stood out from the rest at the conference was Improving the Connection with Online Students through Introductory Videos and Weekly Update Videos by Dale Suffridge of Kennesaw State University. Dale provided a truly “outside of the box” presentation that began with a video showing a computer screen typing an introduction. Dale was able to place the audience in the perspective of a student having to read a typed introduction. Then he proceeded to show a very innovative Introduction video he taped while riding a roller coaster. Needless to say, the video on the roller coaster was much more engaging than the typed introduction. o Vita is of little importance here, this can be found in the faculty bio. o What do you share the first day in a F2F class? A weekly update video can be used in the place of a weekly “housekeeping” email or announcement. It does not need to be an edited video, but just a quick natural, relaxed, conversational video that is reminiscent to the updates and reminders you would give at the beginning or end of a F2F class. A weekly video update provides ongoing personality enforcement and allows for an opportunity to personally recognize student in front of their peers. For example, you can complement students on their discussion responses by name. Just make sure you mention all students at some point during the course. · Lighting – Make sure that the lighting is in front of you, not behind! Dale recorded a weekly update video example during the presentation using his iphone. Here is a link to that video and instructions on how to record weekly update videos with a smartphone. As we become more mobile and physically distant in our communication and teaching methods, using videos provides an excellent opportunity for the students to connect with the faculty and provides an enhanced level of engagement between the faculty and students. I am currently working on my video introduction and have implemented weekly video updates in a course this term. So far the response has been positive. I highly encourage you to consider creating your own. Here are some full length introduction video examples to use for inspiration. 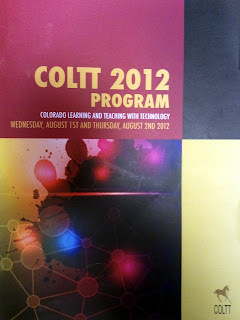 One of the best-kept secrets for educational technology conferences is held annually in Boulder. The Colorado Learning and Teaching with Technology (COLTT) conference is now in its 15th year and held on the CU-Boulder campus. This year all sessions were held at the beautiful Wolf Law Building. My time at this year's conference was limited due to prior commitments. However, attendance time was well spent. Hanna Yang and Lauren Scharff from the USAF Academy presented on results of their research into use of video feedback. The subjects were pre-law students that were videotaped presenting oral arguments of a case. Yang and Scharff interjected captions throughout the video playback so students would know precisely when they did something right or wrong. The overall results were positive, with student subjects grateful for the instant feedback and the ability of knowing the exact moments of significant instances, such as a fidget or a needless utterance (ums, ahs, etc). They used a number of software programs to edit the videos including Jing and Camtasia. I had a good discussion with our Adobe representative. With iOS not supporting Flash video playback, Adobe is coming under increasing pressure to find alternative methods for creating video content supporting playback on devices such as the iPad. This is especially true with Presenter, a favorite software product with RHCHP faculty due to it's simple design and useful features. The latest version is getting closer to a resolution but appears to still miss the mark for iOS compatibility. RHCHP is getting around the issue by posting all video content to Kaltura, our cloud-based video repository. However, this does not address the issue with Presenter files that are PP-based rather than video. Adobe reps will be on campus September 19th and I'm sure this will be a topic of discussion. I also had a brief chat with Al Powell from Colorado State University. Al has extensive experience in lecture capture systems, something that RHCHP is just now beginning to investigate. I'll be connecting with him at a later date as the RHCHP Lecture Capture Task Force makes their recommendations and begins piloting systems in spring 2013. I recently attended the 28th Annual Conference on Distance Teaching and Learning in Madison, WI. I’ve been attending this conference for about 8 years straight. I have to say that this year was a little disappointing for a variety of reasons. I still brought home a few good tips and take aways that will share in this blog post. · Explain all of your teaching strategies on the first day and/or in syllabus. o Take an online quiz during class regarding readings and lectures/ spend time reviewing answers to quiz and addressing questions. · This instructor utilizes a tool called “Google Voice” during class time. This allows students to anonymously text the instructor questions during class. · Immediately after class have an online quiz that goes deeper into the content to measure a level of understanding beyond the basics. Perspective is a platform for exploring, creating, and sharing audiovisual stories with data. Today's storytelling involves a mishmash of apps, websites, blog tools, and technologies. Perspective simplifies all this by combining the essential elements of storytelling into a single iPad App. SimpleMind for iOS is a Mind Mapping tool that turns your iPad, iPhone or iPod Touch into a brainstorming, idea collection and thought structuring device. This was a 10 minute lightning session. I couldn’t write fast enough to collect the information. I find the topic intriguing. Richard talked about how with teaching and learning goals we generally have formal learning, informal learning and integrated learning. He mentioned a tool called “storify.com” that can be used as a social media aggregator. The goal is to create a higher-level of learning and context to social media data on given topics. (To teach how to create new knowledge from existing data.) There are many layers to Twitter: content and curation, crowdsourcing and chronology. Check out the following great resources! 100 million iPads have been sold to colleges and universities. Judy talked a little bit about “the spacing effect,” which for me was the first time I’d heard of it. I guess it refers to the idea (based on some research) that it is better to space out presentations/lectures rather than cramming too much in one time. So tying this in with the mobile revolution, we can provide presentations/lectures/learning content asynchronously where students can access via mobile when the time is right for them. A powerful example Judy gave outlined a thing called “text4Baby.org.” A mother can subscribe when she gets pregnant and the service will text the mother at key appropriate times during the pregnancy (and after baby is born) with tips and healthy prompts/reminders. So they are PUSHED information at the right time. If you compared this situation with say a one-time workshop for new mothers. Those classes can be jam packed full of very important information that certainly can be challenging to remember all of the content.